Is your building working for you? Regardless of industry, running a building is a challenge. And when it comes to energy usage, many businesses aren’t as efficient as they need to be. Lights left on in empty rooms, computers kept on overnight, windows open with the heating set to high… A shocking amount of energy is wasted through human behaviour—which can be a real challenge to keep an eye on, let alone manage. Running a building is already expensive enough, but with rising energy costs, building operators need more control over common energy issues such as under-utilisation, inefficient scheduling, over-performing equipment, and fluctuating supply and demand. Heating and powering buildings accounts for 40% of total energy usage in the UK—and businesses are under more pressure than ever to meet energy reduction targets. The 2018 Government policy paper “The Grand Challenges” outlines the aim of halving energy usage in new buildings by 2030. Preventing resource wastage, reducing energy bills, and meeting complex government policies like ESOS might sound daunting—but it doesn’t need to be. That’s why we’ve partnered with Buddy to make building energy management smarter and greener. Consisting of IoT sensors, SIM-enabled connectivity, and a real-time dashboard, our scalable and customisable smart building solution is designed to turn sensor data into actionable insights. Installed quickly and unobtrusively in a matter of hours, the base unit simply clips to a surface, so there’s no need to shift your equipment or bring the power down. The gateway communicates with the Buddy Platform via Pangea cellular IoT connectivity that supports real-time and reliable streaming of sensor data. Keep an eye on how energy is used within your building(s) and use data to identify patterns, trends, anomalies, and even predict and prevent problems. Optimise and adjust for better building utilisation, set energy efficiency targets, or use data to consider energy efficiency investments and technology. Smart building energy management is the fastest, cheapest way to reduce energy bills and cut greenhouse gas emissions—and will transform the way businesses operate. With data-rich, glance-and-go visuals, public facing dashboards provide the perfect way to engage and empower occupants. Whether the dashboard is displayed in a public area or incorporated into a company intranet site, occupants will always know how their building is performing and where they can make improvements. A streamlined data retrieval and analysis process completely removes the need for manual research via clipboard trips up and down the stairs. Prevent downtime and identify problems with real-time alerts, or use more granular data to develop business cases for new energy efficiency investments and strategies. Streamline and optimise resources so less people can make a bigger impact. For a mid-sized operations or larger, the solution often pays for itself within the first year. An IoT-equipped smart building will have a far easier time going green. Whether it’s an open fridge or a tap left running, pinpointing the causes of excess utility usage allows for the implementation of floor, room, or even desk-specific plans to meet energy targets and green standards, rather than resorting to guesswork or blanket solutions. Set goals, arrange competitions, and send out reports to engage occupants in your energy efficiency journey. Most clients experience 6 – 17% reduction in overall energy consumption as a result of actioning insight from the solution. 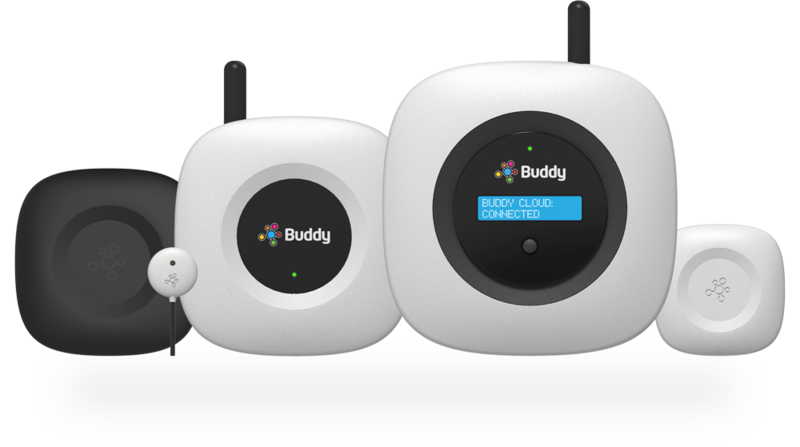 And with scalable offerings that extend to multiple buildings or floors, and customisable solutions tailored to your needs, Buddy gives you the control on how and where you monitor your building’s energy use. Want to know more? Fill out this form and a member of our team will get in touch with you. Alternatively, you can call us on 0800 470 4070.